Retaining their popularity for generations, window shutters today play more than just a functional role. They also enhance room aesthetics and are often employed by interior decorators to play up windows and establish a certain feel or atmosphere in a room or space. 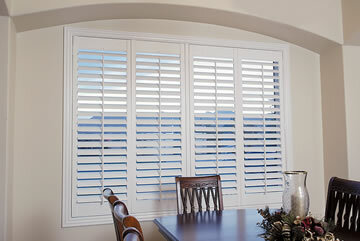 Shutters at Houston Blinds For Less will add significant value to your home and give it a whole new look. Combining timeless style with unmatched functionality, poly and wood plantation shutters can improve your energy efficiency, protect again weather elements, increase privacy and security, and enhance home aesthetics. Unlike curtains or drapes, custom shutters are a permanent addition to your home, and are easier to clean than most window coverings. Houston Blinds For Less offers exquisite window shutters in Houston and surrounding areas, including the high-quality painted plantation shutters and stained wood shutters, carefully handcrafted from solid wood. Living on the Gulf Coast, you may also be interested in poly shutters, which are ideal for high humidity areas. Durable, more affordable poly shutters provide the look of real wood plantation shutters for less. An exquisite and traditional choice, painted solid wood shutters at Houston Blinds For Less are guaranteed to add a rich, architectural appeal and add significant value to your home. Read about our painted plantation shutters. Get the look of real plantation shutters for less. Easy to clean and perfect for high humidity areas, Poly Shutters are beautiful, yet affordable. Read about poly faux wood plantation shutters. 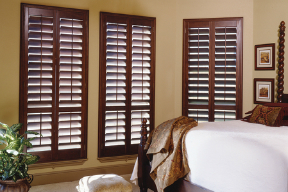 Stained wood shutters at Houston Blinds For Less are all carefully hand crafted to add personality, while preserving the charm that is unique to wood. Read about stained wood shutters. 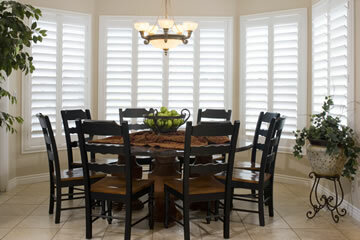 Houston Blinds For Less can help you find out which shutters are best for your home. Call (281) 997-2100 to schedule a free consultation. Our expert representatives will be happy to explain the types of shutters available and the pros and cons of each based on your reasons for wanting new shutters, so you can make a more informed selection. You’ll be amazed how much of a difference custom shutters can bring you. Call Houston Blinds For Less today or fill out the form provided for your free consultation and quote.